(CNN) - Real estate titan Donald Trump was all over the map Friday in his speech to conservatives, criticizing a range of Republicans from Louisiana Gov. Bobby Jindal to former GOP nominee Mitt Romney–and arguing that the country "is in a total mess." The billionaire also cooked up a plate of his own solutions for fixing the economy while speaking to the audience at the Conservative Political Action Conference. Among his advice: Immigration reform could be a "suicide mission" for Republicans and taking oil from Iraq could help reboot the country's economy. As the conference this year serves as a hub for Republican soul-searching, Trump had his own two cents worth of advice. 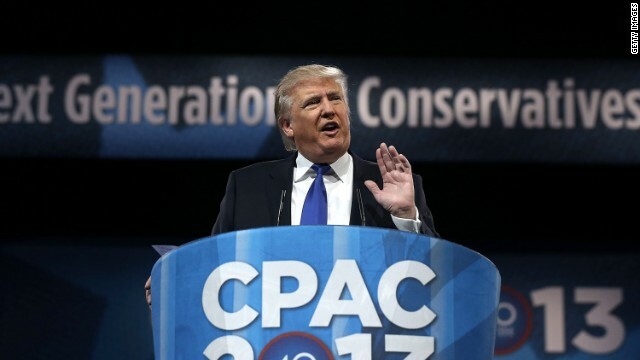 Without mentioning his name, Trump took aim at Jindal, a potential 2016 presidential candidate, for saying at the Republican National Committee winter meeting that the GOP is acting like "the stupid party." "When I heard that statement, I said what a horrible statement to make," Trump said. "What a horrible statement, because that's the statement that's going to come back and haunt you when the Democrats start using it." The media mogul also took a swipe at Romney, saying the GOP nominee and former private equity CEO should have talked more about his success during the campaign. "People really want success. They want a leader who is successful and Mitt has done a great job and I just feel that the Republicans and Mitt–and I told him this–didn't speak enough about the things he did," he said. "The great things. They were on the defensive instead of taking that offensive." Trump, known for his fiery opinions, further lamented the Obama administration, blasting the country's immigration system, lack of manufacturing and fiscal problems. "The fact is we're run by either very foolish or very stupid people. What's going on in this country is unbelievable," he said. "Our country is a total mess. A total and complete mess and what we need is leadership." One of his ideas to boost the economy included a suggestion to take Iraq's oil and "pay ourselves back" for the war. "What the hell are we thinking? For those soldiers that were killed, I said we should pay those families money," he continued. "They lost their sons and their daughters and a million dollars to a family is nothing compared to the kind of wealth that you are talking about over there." Trump added that the leader of Iraq-"we don't even know who the hell it is"-is likely building palaces and a kingdom of wealth now that the U.S. has left, while the American people got "nothing out of it," referring to the war. He also addressed recent calls from Republicans to create a path to citizenship for undocumented immigrants in the U.S.
Trump said if Republicans support such a plan, they'll be adding millions of vote into the Democratic column. "You can be out front, you can be the spearhead, you can do whatever you want to do, but every one of those 11 million people will be voting Democratic. It's just the way it works and you have to be very, very careful because you could say that to a certain extent, the odds aren't looking so great right now for Republicans, that you're on a suicide mission. You're just not going to get those votes." We could nationalize Trumps total assets and pay down a meaningful part of our country's debt. Trump is just plain dumb. He is living proof that wealth and intelligence are only loosely connected. TRUMP RECEIVED VERY WEAK APPLAUSE; just a few weak claps here and there. The last time he spoke at C-PAPPY he received huge applause.